A website where you can watch Anime/ Read Manga and find a match to date near your location. to debut in Febuary. Children are our future. Everything we do is to build a stepping stone for the next generation to rise to premonition. With manga kids will be able to read and learn more enhancing their literary skills. The RockSteady manga is published and it will be sold on the website which is linked to the app. So if people were to go onto the app they would be able to check out all of the things they can buy and if they want they can be redirected from a location within the app to another location to read or watch anime. Our company will reimburse the people who contribute to our book by creating shirts, Skateboards, books, and other merchandise that can all be found at RockSteady.TV . The book will be available in multiple book stores internationally when it is published. Each week on our website will release 18 pages of the manga for viewers to read free of charge. ready-to-use and well-made modules to add membership functionality, to enable members to upload and manage their own anime / videos / movies / dramas, to enable automated anime / videos / movies / dramas website, to host/upload episodes in several languages, Manga Reader to display the chapter’s content page by page with easy navigation system (keyboard shortcuts for visitor navigations and automated image enlarge system (for wide images) are also available. There are 2 available mode of manga chapter reading: multiple pages reading or single page reading. Multiple pages reading will provide a page for every chapter image. Single page reading will provide a single page for every chapter. You can easily switch the reading mode from multiple pages to single page and vice versa. Anime Advanced Search to provide a powerful, complex, flexible, and user friendly search system. Anime list page to list down all available anime with rating system for each anime, viewer statistics, flags(new/updated) and date updated. You can also sort the anime by name, last updated, top rating, most popular, and other sorter fields. Anime of the Week to show the most popular anime within a previous week. We provide an exclusive community center (forum) for our customers. Feel free to post your questions related to the website there (we always reply to every query). Recent anime updates / recent episodes for our homepage with rating system for each episode, viewer statistics and date added. Recently added manga chapters RSS Feed. We will have rss feeds for the whole mangas and for each manga. Recently updated manga series sitemap to provide an XML sitemap for certain amount of recently updated series. Recently published chapters series sitemap to provide an XML sitemap for certain amount of new chapters. Custom Colors – In the new version 4.8 we have now added custom color Buttons, Titles, Pagination, Tabs and Non-Active Tabs. Now more than ever the dating plugin can match the colors of the WordPress theme you use. User Stories – Another new feature in version 4.8 is the Stories feature. This is now in the admin area where you can post success stories from your members along with photos. Check out the demo to see it in action. Force Photo Option – Now you can force your members to upload a photo. Forcing members to upload a photo with their profile is key. You want profiles and you want photos with the profiles. You can turn this feature on or off if you wish. Permalinks – All areas of the dating plugin user side have seo friendly URL’s. This means that all areas of the dating site can be indexed by Google as well as being easily found. Dating Templates – 7 new dating templates have been added to version 4.8. You can use any one of these templates with your WordPress Theme. Check out the 7 new templates by visiting the WordPress Dating Demo. Near Me – This is a new feature we put into version 4.8. It uses Google Geotargeting and the users IP Address. It will show users profiles of members that are near them geographically. Credits – Users can now purchase Credits to send emails. You set the price and the amount of emails they can send per credit. Sidebar Browse – With the DS Browse Sidebar Widget, you can let your members click on Gender Groups and Age Groups that you define via the Widget Admin area. Custom Pagination – Now you can match the pagination results with the color of your site. Simply change the color code to the color you want. Affiliate Program – The WordPress Dating Plugin now contains an Affiliate Program that Affiliates can promote your dating site. Delete Comments– Users have the ability to delete comments that they have previously approved. Delete Gifts – Users have the ability to delete virtual gifts that they have previously approved. When a virtual gift is created the user is notified of the virtual gift. Virtual Gifts – Your users now can send other members Virtual Gifts. Once a Virtual Gift has been sent then the receiving member can approve it or reject it. Meet Me– This is a PlentyOfFish.com type of feature. Users can click on profile photos and answer Yes or No as to if they want to meet that user. Profile Commenting – Users can now comment on user profiles. Comments go to admin for approval and once approved they go to the user for approval. Mobile Dating Browser – Capture all the mobile users that come to your site. The new mobile dating software allows all iPhone and Android mobile phones to view your dating site Viewed Me/I Viewed – Now your users don’t have to worry about finding those profiles they have viewed. Simply click on “I Viewed” to get a list of all the profiles you have looked at. You can also see who’s viewing your profile. This is great to see who’s been checking you out. Simple Registration – User simply have to enter a username and their email address and a password is automatically sent to them. This assures that email addresses are correct. Easy Upgrade – Your users can now have the ability to have Easy Upgrade where they select the Premium Membership that they want and then are taking to Paypal andAuthorize.net to pay with. PayPal Pro as well as PayPal Advanced are now included to offer recurring billing. Enable members/visitors to submit mirror videos for any episode Administrators have full access to modify/manage all mangas submitted by members. The Application -The type of App we are building is for Android and Apple IOS devices. Im making an app for the release of my book "Rock Steady" which is due to debut in October. What we're building is an app known as a “basic” app. The app we are building is based off of our website RockSteady.TV. Once we integrate the website into an app users will be able to read and watch anime in the click of an app. The RockSteady book will be sold on the website which is linked to the app. So if people were to go onto the app they would be able to check out all of the things they can buy and if they want they can be redirected from a location within the app to another location to read or watch anime. Your name in the credits - Your help is vital in making this anime a reality. To show our thanks, we’ll place your name in the credits. Anime forum – We want to have a special place where we can discuss the Anime, Manga, app development, and more with you guys. Ebook – Get an Ebook of the book! Beta access – Play with the app used to watch Anime & Read manga while it’s still in development. T-shirt- Get a T-shirt of the company logo and be apart of the team! Postcard- Get a postcard of the characters displayed in the book! Launch Event- Exclusive access to the launch of the Website. Be among the first to read the book and watch your favorite shows. FanFiction- Write your own volume also known as "ghostwriting" into the book. With the help of the author. Since pre creation the Soul king, has regulated the passage of souls allocating them to life, death,heaven, hell, existence or non existence and has governed the universe. The story begins to unravel with a musician who conquers until he establishes his own empire of Greeks known as the Mycenae. On the year 1265 BC a war breaks out between the seven deadly sins and the Mycenaean.The musicians weaponize sound and fight with instrumental scabbards, changing them into weapons. "God" appears after his sins lose and fights the soul king. The soul king sacrifices his life to seal half of "God" in a nearby guitar. 3266 years later the guitar is discovered by Hiewa Maverick. Get access to our exclusive backer forum where we will answer your questions about the site and seek your advice. Membership access to our Anime website where you can watch anime & read manga along with an App of the Website. A complimentary manga ebook. You also get your name in the credits! If you do not want to support the author each month you can pay once and unsubscribe and you will still recieve your rewards. Get a copy of the prologue that inspired the name of the website. You will get the $1 reward tier. If you do not want to support the author each month you can pay once and unsubscribe and you will still recieve your rewards. I have enlisted the service of expert web developers to create the best website for our customers .The website (RockSteady.TV) we are making will have a homepage that shows 20 pages of the book each week and a comment section below it. The book that inspired the Website is displayed below. There will be a forum. Users can create accounts, sign in and have their own profile page . There will be an ecommerce shop where users can purchase books or other merchandise. There will also be a bulletin board where our staff can tell our users about new features. There will be an admin page where the admin can control the comments section, forum posts, upload new pages of the manga, and add new merchandise. We will build a fully automated manga reader/viewer/anime/video/professional anime / video /streaming / movies / dramas website, that will allow you to upload anime/videos/Manga or we can do it for you so you don’t have to add anime/video/manga and contents manually. With our membership system we offer free accounts and premium accounts. 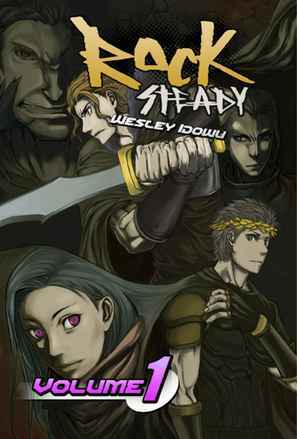 I want to make it clear that your spending a onetime fee of $2.99 to exclusively read "Rock Steady" on the website the other manga and anime shown on the website is free to view. If you make a pledge you only pay a one time fee of $1 and you can be a member for a lifetime.